Today’s guest post is from Mandi, a fruit and veggie enthusiast, over at Big Tiny Steps where she shares how to live a happier, healthier lifestyle. She’ll be sharing with us how to make clean eating on a budget work. Five years ago my family was approximately $80,000 in debt. The journey we undertook to become debt free made us fall in love with numbers and budgets. But now I have a new love. Eating clean. Eating clean with a diet consisting of mostly plant based foods has various health benefits. I know I personally have reaped the rewards that this lifestyle has provided with better overall physical and mental health. One of the common deterrents to eating clean is the fear that it will not be budget friendly. As living costs around the world continue to get higher, many of us are in the position of having to budget carefully when it comes to feeding our families. I should know, I live in Canada where the costs of food is Bananas*! Most cheap and readily available foods are in no way healthy. Many of us are left feeling as if we need to make a choice between our health and our money. However, this is not necessarily the case! Don’t believe me? Check the numbers! January 2017 was my first month postpartum after my third child. I was recovering from the holidays and from being pregnant. I was learning to cope with a newborn, toddler and teenager, and had the baby blues. I was not being my healthiest self when it came to food, and this was reflected in my budget. We were $65.89 over budget in Groceries, $17.49 over budget in Dining Out (this is where we track fast food trips or pizza delivery) and $8.12 over in Miscellaneous Snacking (this is where we would track chips, chocolate bars and pop). In total, my bad eating habits in January led to a $91.50 deficit in my budget. Fast forward a few months and I decided to take control of my physical and mental wellness by eating clean. To be honest I was worried about how this would impact my budget, but I truly felt that my health was worth it. Last month I was pleasantly surprised to have actually SAVED money using the tips and strategies I am going to share with you below. In May 2017 I was $14.78 under budget in groceries, $100 under budget in Dining Out, and $62.76 under budget in Miscellaneous Snacking. This was a total of $177.54 that I got to keep in my happy, healthy little pockets! Doing this was deceptively simple. I just used the strategies below to make my clean eating lifestyle fit my budget. This is not new advice for a good reason – it is fundamental in ensuring that you can eat healthily on a budget. The important thing to remember is to use planning so that you minimize waste. For example, if you can get a fantastic deal on large bags of potatoes or apples, you should take it ONLY if you are confident that they will be used. Remember to think outside the box. If you plan on buying perishable items in bulk, you may want to invest some time and energy into creating a meal plan. One of the best investments we have ever made was our deep freeze. Living in a tiny apartment, we thought that we could never fit one; however it became clear that this was going to be essential for feeding our family on a tight budget. We take scraps of veggies and fruits that have been unused and freeze them before they have the chance to go bad. I use these in chilli, stews, smoothies, and for sauces. Additionally, having prepared freezer meals is a better way to stay on track on busy nights when you would ordinarily order pizza. We use our freezer for storing leftovers, overstock from things we have bought on sale, and to house our batch cooking freezer meals. Try out ethnic markets or local non chain produce stores. I tend to shop at the local chain supermarket but I do find that when I take a little extra time to go to local produce markets I can cut this expense by up to half in some cases. This goes for spices and other cooking items as well. To stay organized and price compare, we make a quick note in a phone app of what our most frequently bought items cost at different shops. Another great idea is to dabble with growing your own food. If you do this, you don’t even need to leave the house to be in your “shopping zone”! I consume very little meat at all but am not a full vegetarian. My family however was full of meat lovers. This could get expensive! Thankfully we have recently started to educate ourselves more on the positive health and environmental impacts of eating a mainly plant based diet which has led to a desire to reduce our meat consumption. This has saved us loads of money. We now are using meat as more of a condiment than main dish in most meals. I feel that aside from saving us money, it has made us healthier and is a more sustainable option. Ever since I started clean eating, I have been focusing on cutting out sauces and spice mixes that contain lots of sugar and salt. This can save money as it can be much cheaper to buy bulk spices and mix them than to buy premade packages and bottles of spices. Plus you have the benefit of knowing exactly what they contain, and that there is no added salt or sugar unless you put it there yourself! I eat a lot more salads now, however I have stopping buying salad dressings. I now use either chopped up veggies to season (such as Pico de Gallo) or I make my own dressings with oils, vinegars, lemon or lime juices and seasonings. This has had a huge impact on our grocery bill, as we used to consume a lot of sauces and dressings. 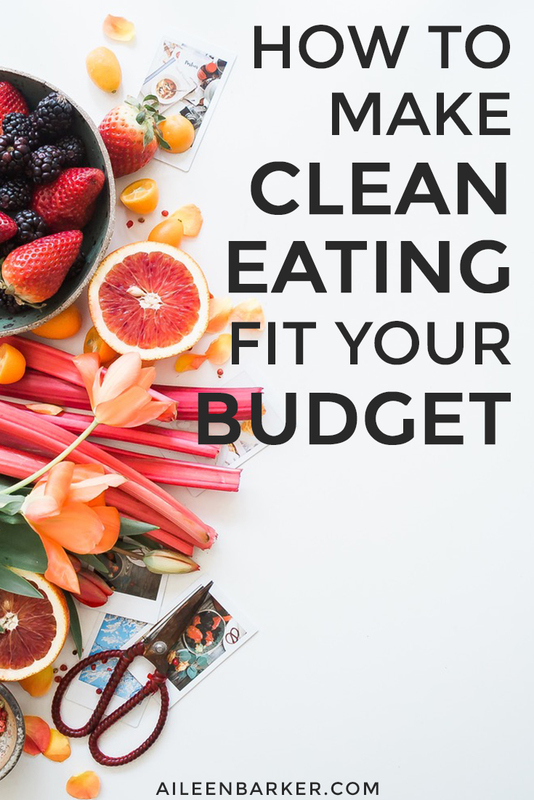 If you have an interest in eating clean and making it fit in your budget it is totally possible! Just remember to be prepared, think ahead, and use creativity while shopping. Even when I have had a month where I am slightly over budget in groceries eating this way, I still wind up under budget in the big picture because I am spending less on processed snacks and quick convenience foods. This in conjunction with my overall improved health has made eating clean very worthwhile.